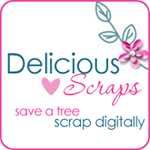 Delicious Scraps: New Store and SALE!! I am selling at a brand new shop!!! Thank you Divine Digital for welcoming me into their awesome team!!! Also my Dollar Daze Sale will wrap up tonight at midnight so hurry in to shop :) I have also extended my Clearance till tonight - it will be permanently gone.